The February 10 collision of an active Iridium satellite and a defunct Russian military communications satellite underlines a concern raised recently at the International Committee on GNSS (ICG) about the need to include coordination of space vehicle (SV) operations. Similar concerns have been expressed in recent years by organizations that have studied the possibility of GNSS satellites, particularly those that have been “parked” in disposal or graveyard orbits, to drift and possibly collide with one another. More than 2,000 satellites, active and decommissioned, are currently orbiting our planet and many times that amount of sizable objects characterized as space debris — mostly within a few hundred miles of Earth. To be sure, the low earth orbits (LEO) of Iridium 33 and Cosmos 2251, which collided at an altitude of just under 500 miles, comprise a much smaller space more heavily populated by SVs than the middle earth orbits (MEO) in which GNSS satellites operate. The volume of a spherical space increases as a cubic function of its radius or, in the case of orbiting satellites, their distance from the center of the Earth. In comparison to LEOs, GPS satellites orbit at an altitude of approximately 12,600 miles (20,200 kilometers); Russia’s GLONASS SVs, at 11,842 miles (19,100 kilometers); Galileo 14,397 miles (23,222 kilometers); and Compass, 13,113 miles (21,150 kilometers). Moreover, because of their system design, GNSS spacecraft transmit their orbital positions (ephemeredes) as part of their navigation messages. Consequently, operational satellites are readily trackable. Decommissioned satellites are switched off and placed into a disposal orbit higher than the operational constellation. Out-of-service GPS satellites, for instance, are placed boosted about 500 kilometers (310 miles) further out into space. With implementation of a new launch, anomaly resolution and disposal operations system (LADO) in 2007, operators with the U.S. Air Force 2nd and 19th Space Operations Squadrons at Schriever Air Force Base, Colorado, took over that responsibility for GPS. LADO successfully performed its first disposal — for GPS SVN 29 — in November 2007. 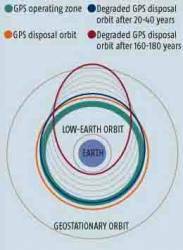 Nonetheless, satellites can drift out of their disposal orbits over time. Although initially circular, as with those of operational SVs, disposed satellites’ orbits eventually become increasingly elliptical, mostly as the result of sun-moon gravitational effects on the spacecraft. In studies for the Air Force early in this decade, Aerospace Corporation researcher Chia-Chun (George) Chao and colleagues predicted that GPS satellites placed in disposal orbits will eventually — in 20 to 40 years — drift down into the operating constellation. Besides intersecting the GPS constellation, these satellites eventually could pose a threat to operational satellites in low Earth and geosynchronous orbits, Chao said. GLONASS, which has about 100 failed satellites within its constellation, is located about 1,000 kilometers (621 miles) lower than GPS and could pose a collision problem in 40 years, the Aerospace studies showed. Similar issues are associated with the Galileo and Compass constellations — both active and defunct spacecraft. The tendency for circular orbits to become elliptical is strongly dependent on orbit inclination and altitude, according to Chao and fellow Aerospace researcher Anne Glick. The effect becomes more pronounced for Galileo orbits due to their higher altitude. Chao suggested that the deterioration of GNSS satellites orbits could be ameliorated by reducing the initial eccentricity of the disposal orbit through precise satellite burn maneuvers. Further, the growth of orbit eccentricity could be reduced by circularizing the initial disposal orbit as much as possible and by achieving a more favorable “argument of perigee,” or orientation of the perigee relative to the equatorial plane. Citing Chao’s proposed strategies for design of stable disposal orbits, the IADC noted that the required additional propellant and orbit-adjust maneuvers might not be desirable or operationally practical. For instance, GPS operators have traditionally jettisoned the excess fuel in decommissioned satellites before boosting them into disposal orbits. Shifting the inclination of the operational orbits by a few degrees was also shown to be effective in avoiding large eccentricity growth, although the potential for affecting constellation coverage was noted. A 2003 study by the Russian Space Agency’s Mission Control Center on the long-term evolution of GPS and GLONASS orbits also showed future interpenetration of the two constellations’ operational zones and recommended circularization of the disposal orbits. In 2007 the IADC, an international association of 11 member space agencies, published updated voluntary guidelines for GEO disposal and identified two “Protected Zones in Space” for GEO and LEO regions, but made no further recommendations on managing MEO GNSS systems. Coincidentally, the Iridium system is also the subject of a Department of Defense–funded effort to enhance the robustness of GPS and space-based positioning by retransmitting GPS system time over the higher powered Iridium communications channels. The so-called High Integrity GPS Technology Concept — known more commonly as iGPS —also also seeks to refine narrow-band ranging techniques using the Iridium satellite broadcasts directly, as well as broadband ranging in the future. The ICG Working Group on Compatibility and Interoperability will meet next on March 2 and 3 in Munich, Germany. the policies, programs, engineering, and most challenging applications of the Global Navigation Satellite Systems: GPS, Galileo, GLONASS, Compass/ Beidou, and related technologies.He bills himself as the "oldest living GNSS journalist." Gibbons lives and works in Eugene, Oregon, USA. What is Doppler collision and is it a problem in GNSS?